Ten weeks ago, I had a blood clot travel to my lungs. I am an ER nurse and have dealt with this type of thing in others for years. But when the situation happened to me, it was very different. It was just another day. I was having a bit of trouble catching my breath but didn’t think much of it. I went to urgent care thinking I had a kidney infection from a kidney stone I passed the week before. Now, remember it was only a bit of trouble catching my breath. I have had this type of thing at times in the past. I had this wonderful nurse practitioner take care of me at the urgent care. I later realized just how incredible she was. But at the time of the visit, she just made me angry. After all, I am a nurse, and I know what I am talking about, NOT always!!!! She decided to do some tests related to the breathing problem. Of course, I knew my breathing was fine. I was ready to walk out of this clinic when I found out a physician I worked with owned the urgent care. I respected this physician and didn’t want him to know I walked out of his clinic. So, there I was, stuck having all of these blood tests done. One of the tests would check for a blood clot in my lungs. Now to make a long story shorter, I had a positive test and was sent to the ER (where I worked) but was in extreme denial that I couldn’t possibly have a problem as fatal as a blood clot in my lungs. But the tests were all repeated and were positive for a Pulmonary embolism. The fear set in right after I finished with the denial state. I was off work for a week and had some time to think about all of this. I could have died and still could die from this problem. No one knew where the clot had come from or why I had one. 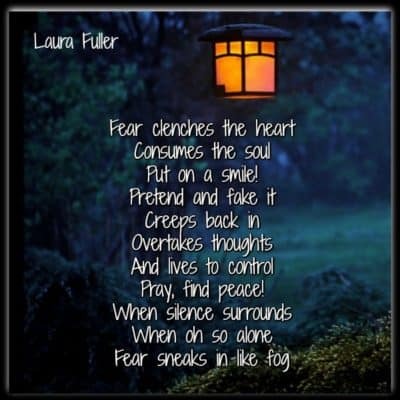 Fear clenched my heart and took over my every thought. I considered myself young and had a concern that I may not live to retire. I wasn’t afraid to die. I knew I would go to heaven. But I wasn’t ready to die. I wanted to live. After this week at home, I trained myself to put on a smile and go one day at a time because this is all I may have left. I didn’t think I was afraid anymore. I went back to work, and when I entered the door, loving, kind and concerned people would say “Oh Laura, you had a PE?” They always said this phrase with an ominous undertone. The fear crept back in and took over my thoughts again. I wanted to overcome the fear. I tried to do it with denial and pretending as if I was perfectly fine. But I still couldn’t breathe. And when I was alone and had time to think my thoughts went straight back to, what if I don’t get to retire in 6 months? What if my husband is left all alone? The mind of a person can be their worst enemy. Our mind can control our every emotion and mood with a single thought. We have to face our fears head on, and this is not what I was doing. Instead, I pretended it wasn’t real. I was in denial of the situation. Nine weeks passed before I found out I do not have a blood Disorder and my prognosis is a full recovery. It wasn’t until I talked to a doctor and found out my recent results that the fear lifted. I had lived with this fear in my heart for the past nine weeks. But all of that time I thought I had come to terms with the anxiety. I thought I had given up the fear. The day I was cleared is the day I realized that fear had controlled my every thought and move since April 17th. I had pushed the fear aside only for it to come back when I least expected. Fear was consuming my life, and I didn’t realize it. As I look back on this situation, I realize that I needed to confront my fear. I needed to face it and deal with it. I needed to look death in the face and understand that I have no control over the outcome. Instead, I just kept pushing it away. I believe this may be how anxiety starts or how it perpetuates itself. Fear creeps into your life along with anxiety. When the concern is not faced, then our body reacts anxiously. I do believe that anxiety is real and it is a change in the brain chemistry. But I also think that if I had continued to live and dwell in fear that I would have changed the chemistry of my body. The reaction to fear will cause changes in the body. My thought for myself and to you is, can we improve anxiety when we decide to face our fears? Can we change the chemical reaction in our brain when we change the way we perceive our situation? And is the answer to meeting our fears in our prayers for peace and guidance? I leave you with these questions, and I will execute these thoughts the next time I have a fearful situation.